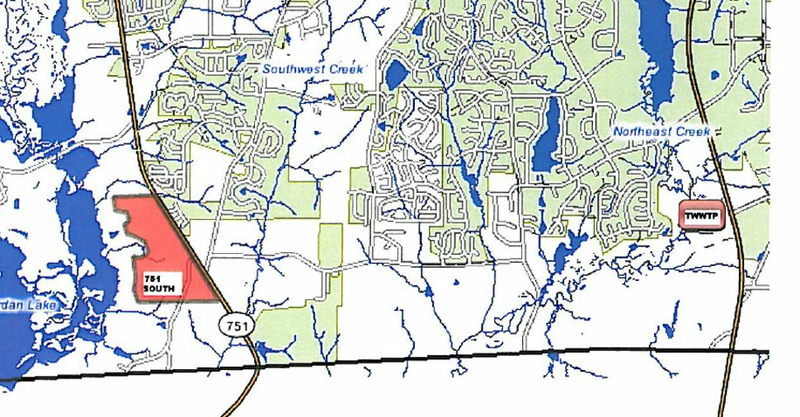 This map shows the distance between the proposed 751 South site (west) and the Triangle Wastewater Treatment Plant (east), both in red. Durham County Manager Mike Ruffin says county commissioners will hear from engineers Monday on how and whether the county could provide sewer services for the pending 751 South development. But the question isn't whether the county can provide the services, Ruffin said. It's whether the county should allow developers to pay to connect to the Triangle Wastewater Treatment Plant. The sewage treatment plant was not intended to serve the nearly 170-acre development site. The development site is actually in an area designated to receive sewer services from the city. As Ruffin told commissioners in a Sept. 6 meeting, allowing the sewer connections to the county plant would be stepping on the city's toes. "I'm making a recommendation that it be denied from a policy perspective," Ruffin reiterated Wednesday. "Serving a development located in another jurisdiction's service area—it's just not the best way to serve it." The best way, he says, is for the city to serve the proposed development with utilities. The closest place the developer could access the county's sewage lines is at least 1.3 miles from the development site. The city's utility lines are much closer than the wastewater treatment plant, Ruffin said. But the Durham City Council has postponed any decision on whether to grant utilities to the development until a pending civil lawsuit involving Durham County Commissioners, the developer and residents opposed to the 751 South project is settled. The case is scheduled for a court date in November, although attorneys have asked about a sooner hearing date. With potential appeals, the case could take years to be resolved. After the city declined to take any immediate action, representatives for Southern Durham Development asked county commissioners to consider at least providing sewer services, and said the developer was considering using community wells for water. The commissioners are expected to receive a written report on the potential sewer services on Friday, Ruffin said. That report will likely also note that a portion of the pipes running from the Triangle Wastewater Treatment Plant toward the 751 South project site are actually owned by the city. If the county were to grant sewer services, the developer would have to get permission from the city to use those pipes, Ruffin said. But in their most recent plans, engineers for the developer are actually using a different route, said County Engineer Glen Whisler. In their newest sketches, the developer won't likely need to use the city-owned infrastructure, and therefore won't require separate permissions from Durham City Council, Whisler said. After getting a preview of the report Friday, commissioners will receive a presentation at their regularly scheduled meeting on Monday, Sept. 26. That's when Ruffin will recommend the denial, he says. The public may comment on the decision, but there won't be a formal public hearing on the matter. If the commissioners approve the sewer agreement, the developer will have to submit plans that ultimately will need approval by the N.C. Department of Environment and Natural Resources. Once the approvals come back, county commissioners would have to agree to a contract with the developer and the developer would owe around $2 million in fees for the sewer use, and would also foot the bill for all improvements and infrastructure required to bring sewer service to the property. Southern Durham Development has sought approvals for the large mixed-use project since 2006, hitting innumerable snags along the way. (See a timeline). Many of those obstacles have been introduced by neighboring property owners and regional environmentalists who worry that the development of 1,300 homes, plus a shopping center and offices, is too close to Jordan Lake. The lake is a drinking water reservoir for several municipalities and its most polluted stretch is located within a few miles of the proposed development. The developer has agreed to comply with new regulations on development in the Jordan Lake watershed, which makes restrictions on stormwater runoff much more stringent to reduce the harmful nutrients washing into the waterway. But the developer will likely be able to reduce the pollutants by only so much on the actual project site. The rest of the reductions would likely occur by the developer paying to clean up water in another spot in the lake. The theory is that this type of "nutrient trading" contributes to the big-picture reduction of pollutants such as nitrogen and phosphorus—naturally occurring nutrients that, when not properly balanced, can contribute to algae growth, reduce oxygen in the water, and generally throw the ecosystem out of whack. More on that nutrient-trading business to come.